Passage of a bullet or pellets through an intermediary object before striking a victim usually results in alteration in the appearance of the wound or wounds incurred. In the case of shotgun pellets, the object may cause the pattern to "open up" sooner than it would have otherwise. The fact that the pellets passed through an intermediary target has to be taken into account when conducting range determinations based on the size of the pellet pattern on the body. Increased dispersion of pellets by an intermediary object can lead to the conclusion that the individual was shot at a greater range than they actually were. 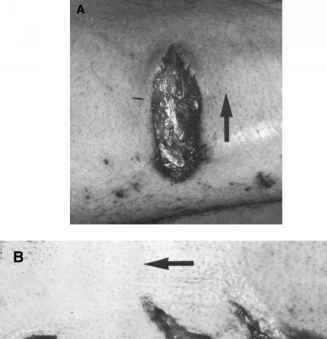 Figure 4.26 (A) Graze wound; (B) tangential wound; (C) superficial perforating wound. Arrow indicates direction of bullet in A-C. 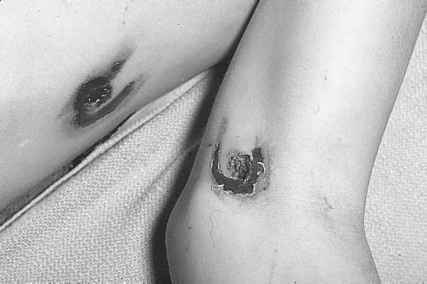 Figure 4.27 (A) Reentry wound with wide irregular abrasion ring and large irregular entrance hole. 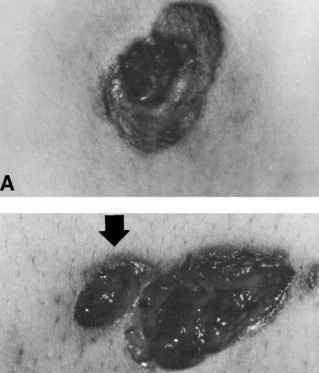 (B) Primary entrance wound (as indicated by arrow) adjacent to large irregular reentry wound. 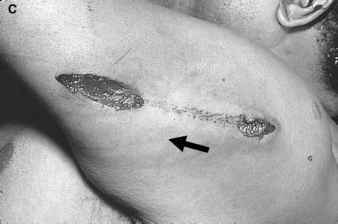 Figure 4.28 Exit and reentry wound (indicated by arrow) of axilla. Figure 4.29 Shored entrance of chest and shored exit of arm. In passing through an object, a bullet may propel fragments of the object forward with the bullet. If the victim is close to the intermediary object, these fragments may strike the individual, embedding themselves in the clothes or skin. 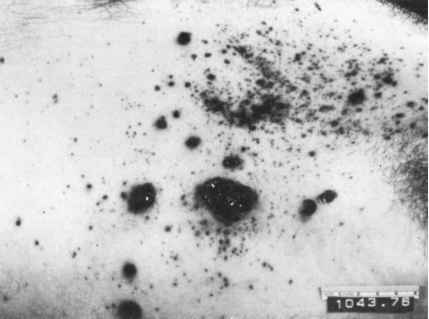 In addition, these fragments may produce pseudo-powder tattoo marks (stippling) of the skin (Figure 4.30). With perforation of wire screens, the pattern of the wire may also be imprinted on the tip of the bullet. In lead or lead-tipped bullets that have passed through glass, glass fragments may be embedded in the tip of the bullet; these may be seen with a dissecting microscope. The gyroscopic spin that stabilizes a bullet as it travels through the air is insufficient to stabilize the bullet as it passes through a solid object. Because of this, the bullet's yaw is accentuated and the bullet may wobble violently. In addition, the bullet may be deformed in its passage through the object. As a result of these factors, when the bullet does strike the victim, the entry wound is usually atypical (see Figure 4.27). The perforation will be larger and more irregular with ragged margins. The surrounding abrasion ring will be irregular and wider. Figure 4.30 (A-B) Wood fragment marks. bullet was fired through a wood door. On passing through the wood, the jacket and core separated with a 16-gr. fragment of jacket penetrating into the brain of a woman, killing her. 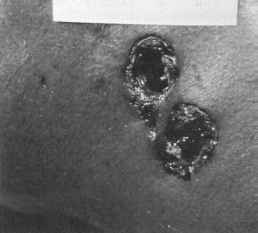 Figure 4.31 Separate entrance wounds from jacket and core of same bullet. Bullet perforated intermediary target. from one bullet (Figure 4.31). The jacket often does not penetrate the body to any significant degree with handgun bullets. Rarely, the bullet on hitting glass may completely disintegrate, showering the individual with fragments of lead, jacket, and glass. This is shown in Figure 4.32, where the individual was shot through the side of a window of a car by a police officer using 110-gr. semi-jacketed hollow-point ammunition. The author has seen a number of individuals shot through car doors with centerfire rifles. The bullets were both full metal-jacketed and hunting. 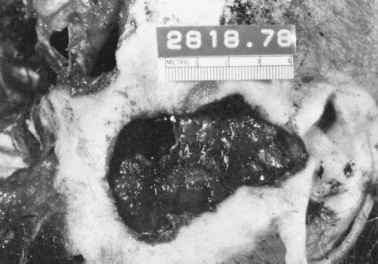 The hunting bullet tended to break up, inflicting multiple (scores even hundreds of) fragment wounds on the victims. The wounds of the torso were penetrating rather than perforating. Fragments of steel from the car doors were recovered from the bodies. In the case of full metal-jacketed bullets (5.56 x 45 and 7.62 x 39), the picture was more variable, depending to some degree, on whether the cores were steel or lead. Some bullets fragmented; others flattened along their long axis, while others appeared unaffected by their perforation of the door. In his paper on the effects of tempered glass on bullet trajectory, Thornton has made some other observations.11 Tempered-glass automobile windows are usually angled inward. On tests with such glass at 20 degrees to the vertical plane, hollow-point pistol ammunition showed an average deflection of 16 degrees from the original trajectory (range, 13.2 to 19.9 degrees), with separation of the jacket from the core in half the tests. Lead bullets showed an average 10.7 degree deflection. 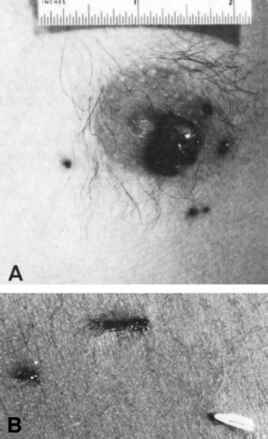 Figure 4.32 Fragment wounds of left side of chest due to disintegration of bullet and side window of car.